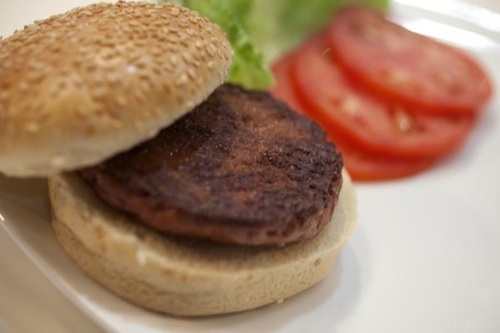 This week in London, three taste testers have consumed the world’s first hamburger patty made with lab-grown or in vitro meat. This first official tasting of the Cultured Beef (as the research team is calling it), had been a much anticipated event. So, how did it taste? As you can hear in the video below, one on the testers said, “There is quite some intense taste. It’s close to meat. It’s not that juicy, but the consistency is perfect”. When asked, “Does it taste like beef?”, another answered, “The texture, the mouth feel, has a feel like meat”. The Cultured Beef has been developed by Professor Mark Post of Maastricht University in the Netherlands, with hundreds of thousands of dollars in initial investment funding, including some from Google co-founder Sergey Brin. The lab-grown meat is made by using some muscle cells scraped painlessly (say researchers) from a cow. The research team then grew 20,000 strands of tissue in a nutrient-rich solution with antibiotics and fetal calf blood. When ready, the strands were mashed into a burger patty. Beet juice and saffron were added to give it the colour of conventional beef. Although this first lab-grown beef has been very expensive to produce, pretty much all first products resulting from new technology research are – and then they start to get cheaper over time. It is asserted that Cultured Beef could help solve the world’s coming food problems, with a population of 9 billion people expected by 2050, many of whom will most likely want to eat meat. Researchers maintain that commercial production of Cultured Beef could begin within 10 to 20 years. As well as helping to feed a population of 9 billion, it is also asserted that lab-grown meat will help combat climate change, as it will take much fewer resources to produce it compared to conventional meat from livestock. Animal welfare issues are also said to be addressed by lab-grown meat, as no whole animal has to grown to produce the meat. What do you think? Would you be prepared to eat Cultured Beef in years to come, or is it not for you?